With the “Ice Age” franchise still making money even after its recent fourth installment, “Rio 2” is Blue Sky Studios’ second movie franchise to get a sequel. 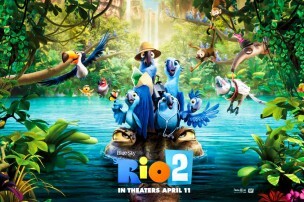 However, despite its strong potential, “Rio 2” may not feel like the highly anticipated sequel that fans have been waiting for. “Rio 2” starts a few years after the first movie left off. Blu (Jesse Eisenberg) and Jewel (Anne Hathaway), two Spix’s Macaws, live in Rio with their friends and three kids. In the meantime, their former owners, Linda (Leslie Mann) and her husband Tulio (Rodrigo Santoro), are busy exploring the Amazon when they discover signs of living Spix’s Macaws, the species which—except for Blu and Jewel’s family—is believed to be extinct. Back in Rio, after the discovery goes public, Jewel convinces Blu and the kids to join Linda and Tulio in hopes of helping them find the flock of birds. Perhaps the main reason why “Rio 2” does not stand out as a worthy sequel is its thematic departure from the previous title, which was, in short, a musical love story about birds. However, “Rio 2” still sparkles on its own with its vivid visuals. The amazon forests are fully textured: Blue Sky pays attention to the tiniest details and uses a colorful palate to create numerous different kinds of birds and plants. The movie was produced in 3D and is one of the few titles worthy of paying the extra price for the so-called gimmicky addition that, in this case, adds a whole new element to the experience. Although the sequel’s plot may be something to frown upon, the music lives up to the expectations. The addition of Bruno Mars and Kristin Chenoweth to the soundtrack allows it to shed light on the movie’s dark side. With various musical numbers spread throughout the nearly 100-minute film, viewers will be pleased with the choreography and the diversity of genres from opera to the folk music of Northern Brazil. Accompanying the mesmerizing music, the voice cast does a wonderful job representing the characters. It is truly sad that the majority of characters, especially the newly introduced ones, suffer from very flat and unappealing personalities that leave the audience disappointed in terms of character development. But whoever thought of casting Chenoweth as a poisonous, tiny frog deserves an award for polishing a poorly developed character. “Rio 2” is mainly aimed toward younger audiences who want no more than a fun-to-look-at film. It can’t be compared to Pixar or Disney titles when it comes to storytelling or character development. Blue Sky has established its own techniques of movie-making during the last decade, and “Rio 2” is an absolute product of this method. It has its funny moments here and there, but the newly introduced characters are disappointingly flat, while the main characters are unrelateable, unless you have seen the previous title. “Rio 2” may ultimately have an eco-friendly message behind its unsettling plot, but it is nothing that you haven’t seen before. With another sequel already in production, I hope the writers learn their lesson from this movie. Blue Sky still has a long way to go in order to catch up with Disney and Pixar, but when it comes to music and visuals, it is definitely heading in the right direction.